Pancake Muddy Paws: Does this mean I really am a runner ? I will confess to feeling very nervous before the start. It was only that morning I finally decided to join in one of the mass starts rather than set out on my own. The organisation was superb, the race control for check in and check out was really easy and there were very friendly marshals on the way round. The route was very well marked, I knew the first section of the route but from about 4 miles in I hadn't run that section previously. I now have a nice shiny shot glass for this race and it is one that I will certainly do again in the future. Meeting other runners and running in a group isn't something I normally do but after meeting so many friendly people I'm certainly going to go along to Steyning Athletic Club and see what it is like. As for the run itself. It was hard. I ended up with very wet feet from about 4 miles in, and that coupled with the fact I think my trainers are at the end of their working life meant that I ended up with a blister on one foot that ended up bursting and bleeding, none too pleasant when I took my socks off ! The sun we had during the week had dried the course out quite a bit, but it was still very muddy in places and I did see one man trying to retrieve a trainer from a particularly muddy section towards the end. I managed the hills better than I thought I would although this is still one area I need to work at. I have realised I really do love running. I love being outside and I love the scenery. Excellent, well done! For a first half that's a really solid time and one you can build on. And yes, you are a runner. 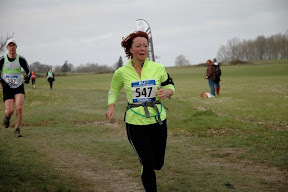 Yes Lisa - you are really a runner.... well done to you for your dedication and hard work paying off!